Continue to Give has upgraded your profile picture settings! Now you can have videos set to your profile image! As soon as someone comes to your site the video you choose will start playing and allow for an interactive experience between your cause and your givers! Having a video playing as soon as someone looks at your profile can be a great benefit to you and your givers. You can be interactive, set a personal tone, and give real life examples of what your givers are helping with. 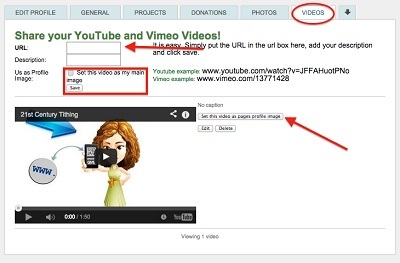 Next to the video you want to choose click the "Set this video as pages profile image"
We believe in innovation! If you have ideas for features that you need comment below!